Nirvana occupies a strange place in music history. In the 90’s, they were universally seen as the most influential band on what came to be known as alternative rock, which was one of the defining phenomenons of the decade. But in the last few years, it seems like the entire idea of alternative rock has gone by the wayside, replaced by a swath of indie bands that have gained increased exposure due to the internet and music sharing. The so-called alternative rock stations of yesteryear are largely ignored and mocked, at least among people I know, as they play bands like Nickelback and Three Days Grace that copied Nirvana’s sound but sucked all of the energy and spirit out of it. So what does all of this mean? For one thing, it’s likely that Nirvana has influenced more bad music than any other band in the last 20 years, and in a way I think that has detracted from their legacy. While the band always had haters, it seems like more than ever it’s become a popular thing to call Nirvana overrated, to chide them for being unoriginal, or to label frontman Kurt Cobain as someone who only has achieved the level of fame that he did because he killed himself at age 27. Oddly, little of this discussion seems to be about the music: Calling Nirvana overrated has just become another tool that people use to try to sound like they’re cooler than other people. Of course, based on their placement of them on this list, you can probably guess what I think of these people. I think they’re wrong. Completely, insanely, embarrassingly wrong. The kind of wrong that makes me wonder if they really have brains that are capable of rational thought. Nirvana is largely deserving of all of the accolades they get and the reputation that they earned, and it is mostly due to Cobain, who is similarly worthy of all the praise heaped upon him. It’s not a result of dying young (although I’m sure it helped), it’s a result of him being a genius songwriter and the perfect frontman for his generation. What’s easy to forget about Cobain and Nirvana (even though I think it’s said a lot) is just how different they were from what had always existed in mainstream rock music before them. The typical rock frontman before them had to be full of cocksure bravado, presenting himself with shirtless, chest-beating machismo. Cobain was the complete opposite of that: A sensitive, troubled guy who would often wear layers of sweaters to try to hide his scrawniness from the public. And he replaced the typical rock male arrogance and swagger with an altruistic view of music: While the typical arrogant male rock star would pat himself on the back for his success, Cobain was always willing to admit that he ripped off the Pixies, to credit contemporary bands that he enjoyed, or to trumpet his own favorite obscure bands of old. Nirvana also came around at the perfect time. They were different, and America badly wanted something different, particularly in rock music, which had been dominated by the bombastic hair metal bands of the 80’s. They broke through with “Nevermind”, a great album that remains possibly the last truly game-changing moment in music. But, while that album may be their most important (and one of the most important in rock music history), I think “In Utero” has always been the more interesting album. “Nevermind” made them the biggest rock band in the world; “In Utero” is the fascinating follow-up from a band and frontman who never really seemed comfortable with that level of popularity. I’ve already mentioned that I think Cobain was a genius songwriter, but it’s admittedly a more subtle kind of genius. It isn’t the kind of genius that immediately shows itself with amazingly complex thoughts that are beyond anything you can understand. Rather, Cobain’s genius lies in simplicity. His uncomplicated song structures, simple lyrics, and seemingly basic melodies never seem like they should be great, but they turned out to be transcendent. He had a knack for finding that simple little melody or lyric that would just stick with you, such as “I tried hard to have a father but instead I had a dad” off album opener “Serve the Servants.” It seems meaningless or nonsensical, but for some reason it’s a line I think about a lot, and that is a testament to Cobain’s abilities. 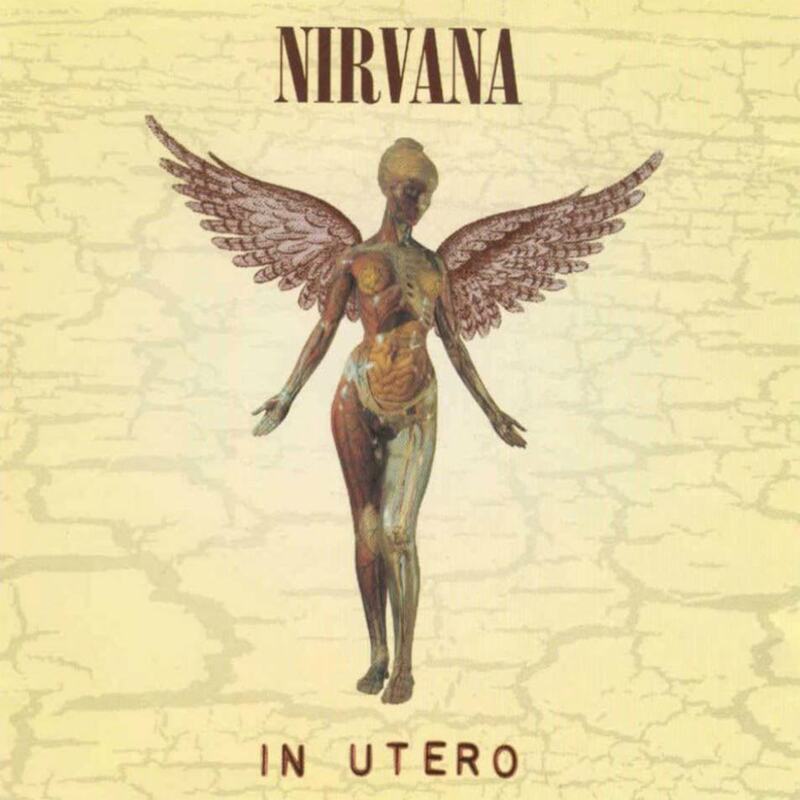 One of the aspects that I always enjoy about “In Utero” is how it seems almost like an attempt at a flop by Nirvana. The band had gained a massive following, and in many ways the album seems like a test of that audience, an attempt to weed out the posers and fakers that Cobain believed had misappropriated their music. “Scentless Apprentice” and “tourette’s” in particular are far cries from the radio-friendly tunes of “Nevermind”, with each featuring Cobain howling over a massive amount of noise. The ironic part is that “In Utero” became a big hit anyways, in part because Cobain just couldn’t seem to help himself when it comes to writing great rock songs. Singles like “Heart-Shaped Box” and “Pennyroyal Tea” are both perfect examples of Nirvana’s quiet-loud dynamics (something they “borrowed” from The Pixies) and huge rock choruses. The album also showed some growth and perhaps hints at maturity from the band, like on the world-weary album closer “All Apologies.” While most of Nirvana’s songs prior to it had been straight-forward grunge rock, “All Apologies” sounded more folk influenced with its cello and Cobain’s bleak lyrics. At the end, he refrains “all in all is all we are”, a typical Cobain-ism that sounds more significant than it should be. “All Apologies” is the ideal closing track to Nirvana’s brief career, and a glimpse at what may have lied ahead for the band had Cobain lived on. Cobain’s death makes it difficult to evaluate his career objectively, and certainly it has been romanticized. But I don’t think it’s an accident that Nirvana is the one band from the scene that continues to be acclaimed, the one that continues to be listened to, and the one that continues to inspire people. “Nevermind” was the commercial breakthrough, but I think “In Utero” does a lot more to explain why this band continues to be cherished by so many. It’s a daring, ambitious, progressive album from a band that probably could have put out anything and had it sell like hotcakes. More than anything else, I think that sense of ambition and punk spirit is what separates Nirvana from their grunge counterparts, and makes them one of the best rock bands of the 90’s.